We all are aware of the fact that networked computing has brought about drastic changes in the world of computing, the most prominent example of which is the Internet. Be it any scientific or technical problem solving, group programming, resource sharing and communication or any other field, networked computing has brought a steep acceleration in the progress of mankind in every sphere. This has been a prime reason behind the recent advancement in research in the area of networked computing. In this article we will contrast two networked computing techniques – Cloud Computing and Grid Computing and understand the demarcation between them. Cloud computing refers to the computing on the ‘network cloud’, in fact in real terms, the ‘Internet cloud’ i.e. is Internet based computing where your hard disk is nothing but the whole ‘Internet cloud’. Resources are provided on demand after authentication of the computer demanding it. Grid computing is the collaboration of multiple administrative computer domains to achieve a common aim. It can be thought of as a ‘virtual super computer’, which is actually a network of loosely coupled ordinary computers sharing their resources and processors to solve a mammoth problem. Thus the grid of computers is utilized to achieve multi-fold throughput by implementing parallel processing among the distributed systems. It is important to note that each participating computer in the grid computing is a fully fledged ordinary computer just like your PC. Cloud computing offers a way of computing where you need not own much physical infrastructure; you can use the services on rent or subscription basis by the third party providers. Thus you need to pay only for what you use. From small software applications to the online operating systems and processing services, everything is available on the cloud at nominal rates either on subscription or utility basis, with little or no upfront payment! Thus cloud computing aims to provide a cost effective and low storage overhead way of computing. Grid computing, on the contrary, is designed to enable users solve problems that have enormous processing requirements. Users in different administrative domains can work out large problems sitting at their own PC nodes and yet having the processing capabilities of super computer. 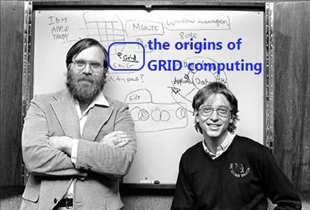 The grid computing system uses ‘middleware’ between the software and hardware to provide an abstract view to the user by hiding the underlying heterogeneous nodes involved. To meet the storage needs of the future is an area of concern for the computer researchers and cloud computing seems to be the only viable solution at the moment. Cloud computing reduces the storage requirements to a huge extent as there is no need to keep the same data/resource on every personal hard disk, rather only a few copies of that resource are sufficient on the cloud. Where, on one hand, cloud computing is a cost effective way of using a large number of resources while at the same time it poses a serious security question as your data is held in the hands of third parties and you have no other choice but to trust them that they will keep your things safe and private. Grid computing is an easy and economical way of achieving the processing capabilities of a super-computer. The problem of security is also a concern as some nodes may turn out to be malicious and there is no central control over things. This problem becomes trivial if one performs frequent tests by sending the same set of sub problems to random nodes to verify that they give the same results. If they do not then one or both of them might be playing on the system. You can easily trace the culprits in this way. Cloud and Grid Computing are the recent networked computing techniques. 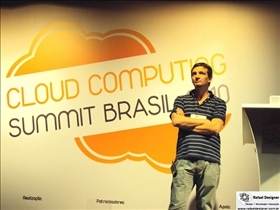 Cloud computing is the mass sharing of computer resources sharable on the ‘internet cloud’. Grid Computing is all about achieving high computational speeds via parallel processing on a network. Cloud Computing is an economical way of accessing the resources which otherwise are very expensive if needed to be bought individually. Grid computing is a cost effective method to achieve the capabilities of a super computer. Which technology is easier to manage? Google vs. Apple: Technology Forward?